Blackberries and peaches aren't usually paired with pork but I like the way that roasting brings out additional sweetness and flavors to the fruit that complements the pork wonderfully. Pork is great at many different temperatures depending on your personal preferences. I started out eating it at 138°F (59°C) but I've slowly moved to 140°F (60°C) for most of my cooking. Many people enjoy it anywhere between 135°F to 149°F (57.8°C to 65°C) so feel free to experiment and see where you like it best. 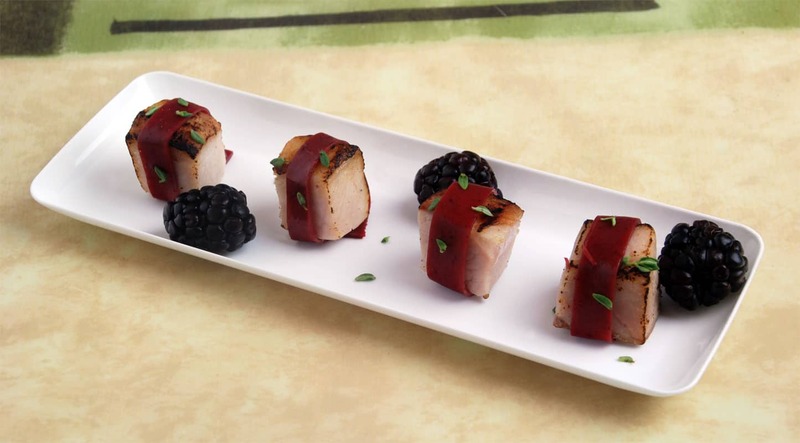 You can make both the sous vide pork and the blackberry-peach gel sheet a day ahead of time. I try to sear the pork close to the time of serving so it stays hot though. If you would like more information about the modernist techniques, ingredients, and equipment used in the blackberry-peach wrapped pork recipe you can check out the following. Remove the pork from the sous vide pouches and pat dry. Quickly sear each slab in a pan over medium-high heat, until just browned. Remove from the heat. Toss the blackberries with half of the oil and place on one half of a baking sheet. Coarsely chop the peaches then toss with the remaining oil. Place the peaches on the other half of the baking sheet, keeping the blackberries and peaches relatively separate. Bake the fruit until they have started to release their juices. Remove from the heat. Scrap the blackberries into a bowl, add the water and puree well. Strain out the seeds and larger pieces of pulp. Combine the peaches and strained blackberry juice with the honey, lime juice, ancho powder, and coriander then puree with a blender or food processor until smooth. Blend the agar and locust bean gum into the blackberry peach puree. Place the mixture in a pot and bring to a boil, then let simmer for 3 to 5 minutes. Pour the hot gel onto the baking sheets, trying to keep the depth of the liquid very small, about 1/8 inch to 1/16 inch (2 mm to 4 mm). Let set for at least 10 minutes, or preferably at least an hour in the refrigerator. Once fully set, carefully cut the sheets into strips 0.75 inch (18 mm) wide and long enough to wrap around a 1 inch (25 mm) pork cube. Combine the salt and liquid smoke in a bowl and mix well until the salt is dissolved. Combine the remaining ingredients in a bowl and blend well with an immersion blender. The Smoke Bomb sauce will keep in an airtight container placed in the refrigerator for several weeks. Cut the pork loins into cubes 1 inch (25 mm) on each side. Wrap the cube with a strip of the blackberry-peach gel and hold in place with a toothpick if desired. Place on a serving dish and top the pork with a dab of the smoke bomb sauce and some thyme leaves. 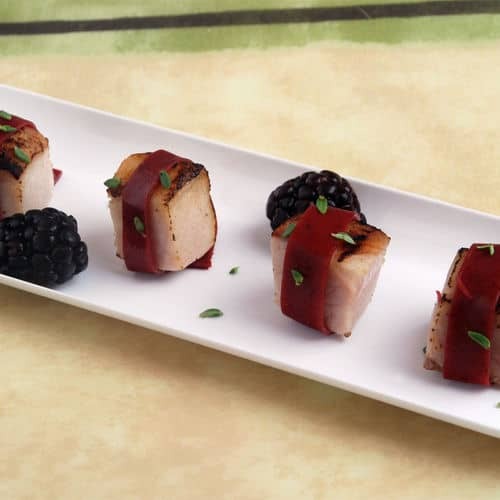 This blackberry and peach wrapped sous vide pork offering is a star at any party! The roasted fruit makes the perfect complement to the pork. Serve them on unique plates and enjoy the compliments!